Eirik lives in Bergen, Norway and takes a wide range of photographs, from landscapes to street scenes, all of which is striking. Eirik Holmoyvik is a photographer based in Norway who covers a wide range of subjects. He seems to always be experimenting and pushing his own boundaries. 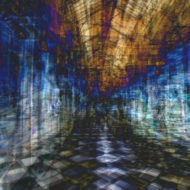 His web site shows work shot conventionally, using long exposures, the Lensbaby, pinhole cameras and more. His subject matter ranges from the landscape to people. Eirik’s website shows the range of work he produces. His landscape work is striking. A range of approaches, from conventional through long exposure to pinhole, produces monochrome landscapes from Norway and Iceland. The stunning subject matter is greatly enhanced by excellent photographic technique to produce landscape images that anyone would love to call theirs. Other galleries show Eirik’s striking street photography. Strong use of light and shade create very graphic images and are highly rewarding to examine. There is a lot of work here to examine, and it is worth spending the time to carefully go through the galleries. One series that looks at the world through a child’s eyes is shot in color and is stunning work. The use of vignette, contrast and soft focus/blur works amazingly well and I found took me back to the color photographs of my own childhood. The website is simply done in HTML is a style which I find very reminiscent of blogs. The gallery pages adopt a simple but highly effective approach of putting the large view image at the top and then below this, putting decent size thumbnails of all the other images in the gallery. This makes it very easy, with only vertical scrolling, to work out which image you want to look at next. Pages are fast to load ad work well, providing a clean interface to concentrate on the images. I’m impressed by the huge amount of wonderful work out there and Eirik’s is up there with the best. His landscapes are inspiring for my own attempts in this field, while his street photography is hugely impressive and shows just what you can produce from the familiar that is around you if you are just open to it. Even familiar locations can be made into strong, graphic elements, as Eirik has done with his use of light, contrast and framing. ‘The way children see the world’ series shows the value in trying something different. I encourage you to have a good look around Eirik’s site. The work is simply great.